Frankfurt, London, New York, Chicago – 6 December 2018 – Eurex, Europe’s largest derivatives exchange, and Vela, a global leader in trading and market access technology, have teamed up to facilitate electronic access to Eurex EnLight, the new selective request-for-quote (RfQ) platform, via Vela’s Metro Trading Platform. This further supports market participants seeking to trade via Eurex EnLight as Vela’s technology solution will be a new alternative to the existing ways of accessing the RfQ platform. With this development, market participants can expect further operational efficiencies, regulatory compliance with data reporting tools and best execution, improvements to accessing liquidity, and a reduction in quote response times on the platform. 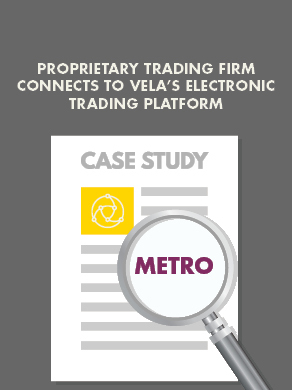 Vela’s Metro is a high-performance trading platform supporting automated, algorithmic, and click trading strategies. It is a complete solution for options pricing, execution, and risk management combined with best-of-breed API extensibility. Operated by Deutsche Börse Group, Eurex offers a broad range of international benchmark products and operate one of the most liquid fixed income markets in the world, featuring open and low-cost electronic access. With market participants connected from 700 locations worldwide, trading volume at Eurex exceeds 1.6 billion contracts a year, making us the market place of choice for the derivatives community worldwide. To find out more about Eurex EnLight visit here.